Aghadoe Heights is widely recognised as one of Ireland's premier 5* hotels, and successfully blends the luxury and style of a contemporary international hotel, with the welcoming comfort of a country house. Complimentary shuttle service into Killarney Town! Subject to availability and group size. Complimentary upgrade to lake side room! Subject to availability. There is a range of accommodation options to suit the desires of all travelling golfers, from the classic rooms, lake and garden views, to the Aghadoe Suite and the magnificent Penthouse unit. 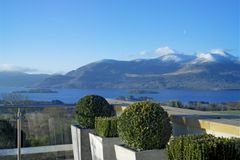 The top-quality on offer is continued in the dining and leisure facilities, and outside the hotel the standard continues; Aghadoe Heights is fortunate to overlook the magnificent Lakes of Killarney, and is within easy striking distance of the delights of Killarney and the superb golf in the area. The unique spa facility at Aghadoe Heights is the focal point for those who seek relaxation. Specialist health and beauty treatments are complemented by the tranquil, peaceful environment in which to unwind. The leisure complex offers a 14-metre swimming pool featuring a whispering waterfall, Jacuzzi, outdoor tennis courts and a well-furnished gym. The Lake Room, the best restaurant in Aghadoe Heights, has received two Rosettes from the AA, and has a unique movable wooden construction that can divide the space up according to the evening's diners. The Heights Bar and Lounge has an excellent wine list and serves serves all day casual dining and Traditional Afternoon Tea.